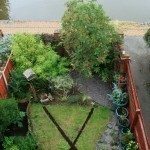 Should there be a distance between patio fruit trees like apple, pear and plum? You don't need to keep them separated. The only time there is a concern with cross pollination is if you plan on growing the seeds from the fruit. For trees in containers, you want to have a reasonable distance of a few feet between, just so there is good airflow on the plants, but other than that, there is no reason or need to keep them apart.